This reproduction depicts a somber looking vintage poster. It States: We here highly resolve that these dead shall not have died in vain. 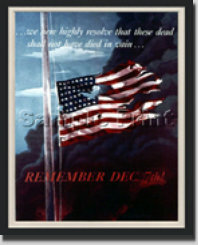 Helped promote thought and pays tribute to all our military and country. Poster designed by Allen Sandburg, issued by the Office of War Information, Washington DC., in 1942 in remembrance of the Japanese Attack on <?xml:namespace prefix = "st1" ns = "urn:schemas-microsoft-com:office:smarttags" />Pearl Harbor on 7 December 1941. Donated to the Navy Art center by Dr. Robert L. Scheina 1970. Because of its unique natural woven texture canvas offers aspecial and distinctive look that can only be captured on canvas. The canvas print does not need glass thereby enhancing the appearance of your print, eliminating glare and reducing your overall cost.